So the real reason for Easter isn’t the bunny or eggs or chocolate but the death and resurrection of Jesus Christ. However, since there are so many eggs and items associated with the true Easter, I thought why not utilize those items and still talk about the true Easter? 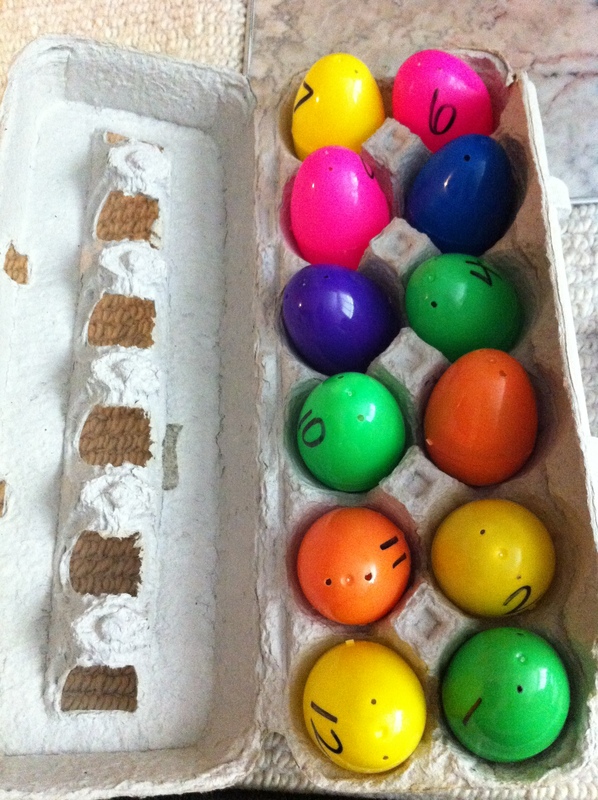 I found a site (http://www.more4kids.info/384/explaining-easter-to-children/) mentioning Resurrection Eggs, so I used ideas from there: bought plastic eggs, numbered them, and placed them in a carton. The kids were in rotating groups in my class, so when they arrived at my station, they sat in a circle and I introduced the eggs. Beginning with the first egg, I would open it, let them look at the item, pass it around in the circle, and discuss what it represents. I was very surprised how captivated the 4th/5th graders were with this activity. Some of the regularly misbehaved kids actually sat until the very end, even when their parents had arrived, to finish seeing what was in the last egg! A few weeks ago I had the privilege of attending a CPC Conference in Orlando, FL. It was an incredible few days of lessons, speakers, worship, networking, and prayer with fellow kid’s ministry people. There was such a vast amount of information available, that I’m nervous I’ll forget it all and not even get to share it with teachers and helpers in my department. A teacher told me that if leaders are provided an opportunity to go to such an event, it would only be fair to share what we learned! Otherwise it’s a waste of resources. What is the point to learn and be inspired and then keep it all to ourselves? The objective is HEALTH (big doesn’t mean healthy). The result is GROWTH. The means is an intentional discipleship process. Doing things on purpose. Key element: balance. Intentional discipleship: purpose, process, people, pathway. Random activity can be motion with no meaning. Move from random activity to intentional discipleship. Relevance is being aware of your culture and being willing to adapt in order to effectively communicate and connect with your audience. Adapt the METHOD, not the MESSAGE. Relevance rarely naturally exists. It requires INTENTIONAL EFFORT. Relevance isn’t about the latest gadgets and toys, but about CONNECTION. Flyers get tossed to the ground. Not appealing enough, too much information, parents don’t know where to start. Little card with 1 question per week to prompt spiritual discussion (45 seconds!) ex: What is your favorite worship song? What did you learn about Paul today? If parents are given small tasks, they will feel more enabled to accomplish this task. Email: if parents want extra connections, emails, etc., have THEM provide you with their email address. Don’t force information/resources on them. Make them take 1 step. Don’t do everything by yourself. Learn from others. The rest is a random compilation of notes. You can’t get to where to you want to go if you don’t know where you ARE. The longer you stay in the same situation, the less you notice what needs to be done. how do we help mom & dad help kids have those conversations? We have a generation of “lost” kids who don’t know about Jesus, don’t care about the truth of God or for Christians. A generation of “christian” kids who don’t live for Jesus. They are OVER-ENTERTAINED and UNDER-CHALLENGED. Scriptures: share it over and over and over again. Memorize it. Sharing Stories: we have to be willing to be vulnerable to share our personal stories. Give room for kids to share stories. Field Trips/Kids on a mission while you’re there: clean up, leave better place than what you had. Be on mission yourself: is it possible to call our kids to do something we’re not doing? Volunteers come and go –> committed communities never leave. Being a leader means I need to make all decisions. I need to change everything. Because I’m called to ministry, God will fill gap at home. I need to get everyone on the same page. Our goal is to EMPOWER OTHERS to make decisions. Systems or culture problems often masquerade as curriculum problems. You do ministry with people that do a small but pivotal part of life of kids. Need to change things strategically. Your family is your PRIMARY ministry. *If you lose your family, you lose your ministry. God will fill gaps in church that we can’t. Invest your time in people that believe in you and vision that God gave you. Ask: Do I believe in my leader and/or his vision? If not, you need to “free” your future. Need to know WHY. When you start with “why”, what and how make much more sense. Why do they need you? To grow them spiritually (they would feel used otherwise) to pour into them relationally, thank them incessantly, specifically. Kids walk away from faith because they never got it. 1. Talk to them how they talk to you-if they’re shy, be shy, etc. Don’t just copy somebody, be original! do you have infrastructure for this resource? should you? cost/value analysis: is it worth it? does it fit our culture? what are churches around NOT doing? what is the need other churches not meeting? consider the source: is there a rush to change? is God giving an irrational desire to do this? 1. Did you have fun? Growth: How do you determine if they grow in their faith? engage volunteers –> OWN the lesson. Until you can say “FOLLOW ME” you cannot say anything at all. Our kids need to see us real, authentic, consistent with living out the gospel. Look for opportunities to have OTHERS share their personal stories. Give room for kids to encounter the living God. ***Are we so focused on teaching a lesson that we don’t give room for Holy Spirit? When was the last time we prayed an earnest prayer with our team? Psalm 32:1-5 How happy is the one whose rebellious acts are forgiven, whose sin is pardoned! How happy is the one whose wrongdoing the Lord does not punish, in whose spirit there is no deceit. When I refused to confess my sin, my whole body wasted away, while I groaned in pain all day long. For day and night you tormented me; you tried to destroy me in the intense heat of summer. Then I confessed my sin; I no longer covered up my wrongdoing. I said, “I will confess my rebellious acts to the Lord.” And then you forgave my sins. Psalm 51:1-4 Have mercy on me, O God, because of your loyal love! Because of your great compassion, wipe away my rebellious acts! Scrub away my wrongdoing! Cleanse me of my sin! For I am aware of my rebellious acts; I am forever conscious of my sin. Against you, especially you, I have sinned; I have done what is sinful in your sight. So you are just when you confront me; you are right when you condemn me. Sin is like germs which are all around us. We need to be washed away from them, constantly, again and again. Germs travel from one place to another and are invisible. Washing hands with soap will eliminate the germs, but as soon as something else containing germs comes close, we get contaminated with them again. It’s a cycle. With sin, we can be cleansed by praying and asking God for forgiveness, but we live in a sinful world, we are sinful by nature, so we need to constantly be on the look out for exposure and contamination of sin. Great video about germs planning attacks against humans. A few questions related to sin could be: what steps can we take to protect ourselves from sin that is waiting for us? What happens when we sin? What are our weapons against sin? 1-5 minutes, more if time allows.